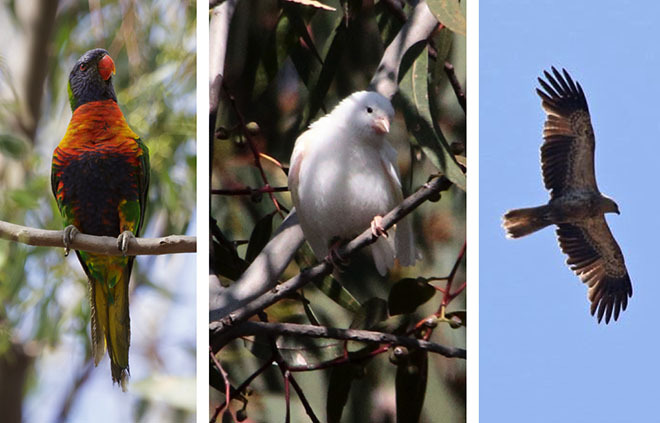 Forty members gathered at Newport Lakes Reserve in perfect weather conditions and watched numerous birds in the car park, including a female Rufous Whistler, Silvereyes and Rainbow Lorikeets. Many of the eucalypts in the reserve were flowering, where the dominant birds were Red Wattlebirds and New Holland Honeyeaters. Whistling Kite and Collared Sparrowhawk were the only raptors. Fifty-one species were recorded for Newport Lakes. Most of the group then drove down Maddox Street to the shore for lunch. It was high tide which limited the number of waders to be seen at the beach, though Black Swans, Australian Pelicans and gulls were plentiful. A walk through Jawbone Reserve was most productive, with good views of Sharp-tailed Sandpipers, Red-kneed Dotterels, Black-winged Stilts, Hardheads and numerous other ducks, of which Blue-billed were the most unusual. A Buff-banded Rail and a swimming snake added to the interest. Several Royal Spoonbills were displaying their spectacular breeding ‘hairstyles’ and the many cormorants were in splendid plumage. A pair of White-fronted Chats was seen towards the end of the walk. A few members returned for a second look at the shore and were rewarded with a great view of a Caspian Tern perched on the breakwater, being mobbed by Silver Gulls, as well as a flock of Bar-tailed Godwits in the distance. Fifty-eight species were recorded for Jawbone with a magnificent 76 species for the day. The weather was overcast but with little wind, giving good conditions for the forty-two members who met at Newport Lakes. Flocks of small bush birds such as Red-browed Finches and Superb Fairy-wrens were plentiful along the edges of the tracks. A Nankeen Night-Heron was perched by the creek at the Amphitheatre whilst two young Red Wattlebirds being fed in their nest provided another highlight. A male Australasian Darter standing on a rock near the stepping stones was much admired and further along three Cormorant species; Great, Little Black and Little Pied were all perched on the same old stag, providing good comparisons. Inevitably, with such a large group, some species were not seen by everyone. For example, those near the front had a clear view of a Rufous Whistler while those at the back saw a Collared Sparrowhawk and a Sacred Kingfisher. A total of 47 species was recorded during the morning walk around the lakes. Most of the group then drove down Maddox Street to the Bay, where lunch was taken beside the recently refurbished hide. Scopes proved useful in identifying five distant Gull-billed Terns and also for enabling close-up views of Common Greenshank and Royal Spoonbill. Many other waterbirds were seen from this excellent picnic spot, including several hundred roosting Whiskered Terns. The afternoon walk took us from the lunch spot into Jawbone Reserve using the coastal cycle/walking track. There were good sightings of waders such as Sharp-tailed Sandpipers and Red-kneed Dotterels in the salt marshes and numerous ducks on the deeper ponds. Several male Blue-billed Ducks as well as Great-crested Grebes were in full breeding plumage. Another interesting sighting was of European Greenfinch eating seeds from an aquatic plant on a small wetland beside the path. 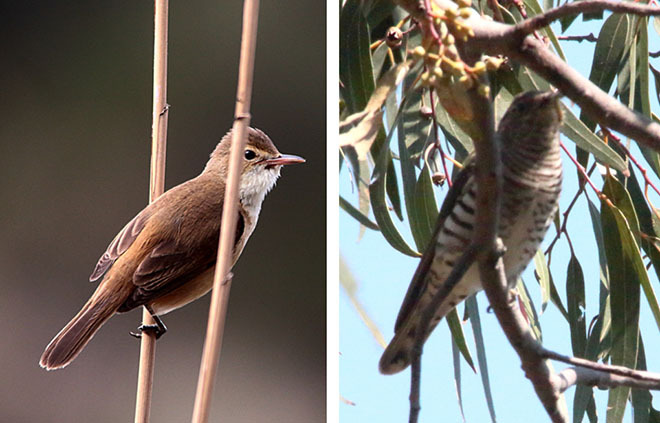 This was a most productive and enjoyable day with an overall total of 71 species, from 47 at Newport Lakes and 55 at Jawbone Reserve and beach.